PlayOnLinux 2.2.0, PlayOnLinux-Script-Creator 0.1 Stable: what a number of news! PlayOnLinux's team has great news to announce. We have thought to you all the week-end, working to improve the project. Are you ready to know everything that changed in this version? So hold on! I want to signal that,during this version's development, I lost my ~/.PlayOnLinux folder. I will be more prudent next time. With double-click support, it's more pleasent. For nostalgics, a new "menu_list" function, which use the old menus, was created. These repositories are now activated as default setting after reproaches of "small game's list" we had. No, you aren't dreaming! For non yet scripted applications, and I insist, only for non scripted applications, you can install automatically your CD-ROM. See by yourself. Oh! A new button. 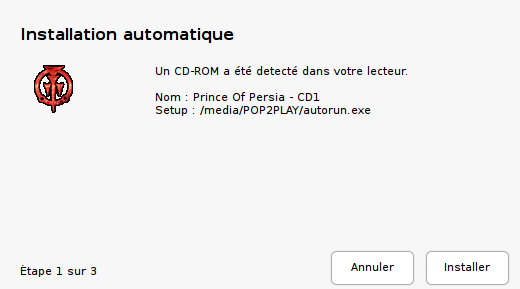 Let's try to insert a CD-ROM et let's see what happen! And if I click on "Next"? Then, it installs the game. What to ask more? Well, and if my CD isn't mounted in /media? Translation files were updated. Thank to everyone who sent me language packs. I count on you to help me to translate the few new lines of the 2.2 and 2.1 versions for the non yet updated languages. A lot of commands (for the scripts) are translated in English. MulX is writing a superb documentation for more details about them. Thank to him. Just let him some time to finish it. I planned to add some help in the different functions' windows, examples, the few lacking POL's functions (if some are remaining ). In a future version, I will start the development of a syntax's coloration and a tab system. A last thing before letting you play in peace, POLSC is still a young project, there is certainly some bugs, orthography mistakes and improvements are still possible, I count on you to help me and I thank you in advance! It help me to make a piece of software which answer to POLians' needs. I still have matter for work, I go back coding! Good evening to all, we thank you for your fidelity. Yesterday, Tom Wickline published on Wine Review the first part of his benchmark comparing performance of CrossOver Games 7.0 against Wine 0.9.58. He describes the 4 tests he ran (i.e 3DMark 2000, 3DMark 2001, 3DMark 2003 and Aquamark 3) and shows their respective results but you will have to wait for the 2nd part (which won't be publish before 3 weeks at least because he is in vacation) to see the conclusions. In his latest video, Shawn Powers (from the Linux Journal's redaction) explains us briefly what are some possible ways to play your Windows games on Linux. He talks mainly about the commercial projects that are the well known Cedega from TransGaming and the brand new Crossover Games, a game-dedicated version of Codeweavers' Crossover. But if you listen well, he talks, at the end, about free and open source projects that make Windows games playable too. And guess what? PlayOnLinux is part of them! So to watch this video, find links to the related projects or simply comment their video, see Play Windows Games on Linux at Linux Journal's website. They now seem less like obscure codenames. It's more welcoming and clearer. I'm very happy, after a month (more or less intense) of work, to present you the official editor for PlayOnLinux's scripts. This piece of software aims to assist you during script creation, by adding functions very simply, without having bash knowledges. 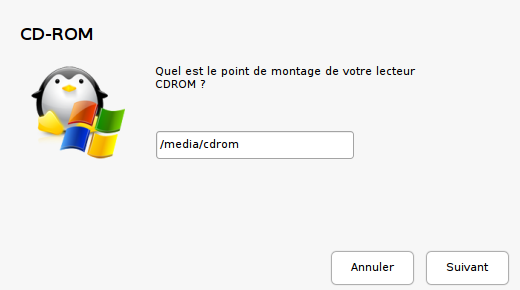 For example, if you want to verify the presence of a CD-ROM, click on Functions > Check the CD-ROM. An assistant will ask you the mount point and the path to the launcher to verify ; the interface will add the corresponding bash command, ready to use, in your script. Simple, isn't it? This is a beta version, thus a lot of functions are lacking and some bugs remain. Before burning me as if I was a witch, please know that my English probably contains mistakes, you can report them, I will correct them very quickly. - You can run your current script from the POLSC's interface, like the PlayOnLinux's function named "Run a non-official script". - 12 functions of PlayOnLinux ready to use. You can use it but remember that all the other commands and the help texts will be corrected and completed as soon as the the documentation will be released. 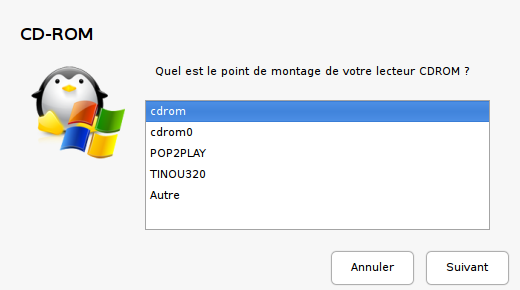 To start POLSC, nothing easier, just extract the archive, then click on the "playonlinux-script-creator" launcher. I also would like to thank my daddy and my mommy X@viou from the http://www.wxdev.fr website, for his help on wxWidgets and Tinou the big boss, for making the icon, preparing with me the publication of this version and sustaining me when I was experiencing difficulties (being not a god in programming, I experienced a lot!). Good scripting, and see you soon for a new version! For a surprise, it's an excellent one! 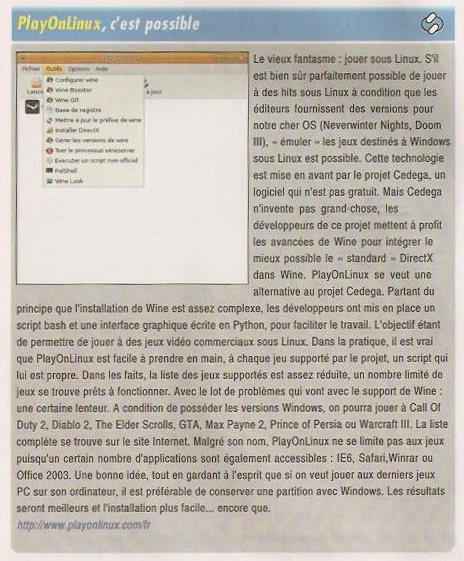 In its April-May 2008 number (n°51), the French bi-monthly magazine Planète Linux propose a little article about PlayOnLinux! You'll find it in the "Logithèque" heading, at the page n° 44. Let's specify that it's the first appearance of PlayOnLinux in a paper press magazine (at least, the first we know). We sincerely thank the Planète Linux's redaction (particularly Arnaud Faque and David Sagnol, authors of the article) and its editor, DP Presse. Feel free to tell us if you know others magazines that speak about us. PlayOnLinux 2.1.0: at last ! Today a new major version of PlayOnLinux is released! The development of the 2.0.x branch is finished, it's now time for the 2.1.x one. It's much more pleasant to see "Français", "English", "Italiano", isn't it? As you can understand, I don't speak fluently 9 languages. So I simply let in English the new translated parts, waiting for the different language files to be updated. We need you to finish translating the other language files. You will quickly realize that the interface is became much more accessible. We had a lot of notes saying: PlayOnLinux is too "Online" oriented. Indeed, it was impossible to install Steam without having internet for example. Problem fixed! 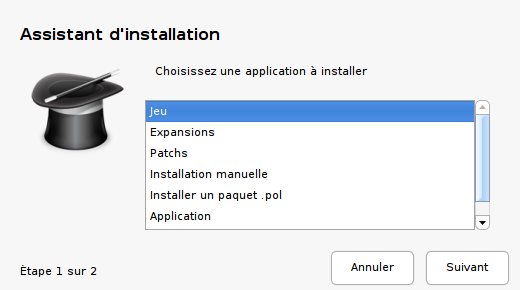 In the Installation menu, you have now an "Install a .pol package" option. We renamed Live Install and we profited of it to improve it. It's now named "Manual Installation" and will additionally allow you to manually suppress a wine prefixes. - In order to avoid a surcharge of the menus, Wine GIT was moved inside of "Manage wine versions"
Available since April 4th, 2008, here is the 0.9.59 Wine's release, a free implementation of Windows on Unix. - Improved support for the .NET framework. - Better services handling through a separate services.exe process. - Support for ATI fragment shader. - Better support for http proxies. - Pre-compiled fonts are now available in the source tree. After a number of problems with the official and main chat, the la community decided to create a Jabber chatroom. You have to own a Jabber address to conect to the chat. Reminder: Jabber is an Instant Messaging system like MSN but totally open and free. You can acces to it very easily with Pidgin or Kopete for example. More informations about Jabber here. Right click on you jabber account icon (at the bottom on the right) > Join a chatroom > Fill the Room, Server and Pseudonym fields then click on "Join"
However this chat is administrated by some of the PlayOnLinux's administrators and moderators, it stays totally independent from the website and keep a purely community spirit (help demand in particular). But we recommend the forum as main source of help. For any suggestion, bug, partnership, proposition and candidature, thank you to post your requests on the official forum. To keep in mind: For any help in live, you should privilege the official IRC chat. You will find there the official support, where you can make suggestions and report bugs too. The development of PlayOnLinux's next versions will start soon, so we want to assure linguistic updates of quality for them. Everyone who is motivated will be part of the staff and thus will have different privileges and will participate actively to an extending project. If you have the required profile, feel free to contact Zoloom or the main administrator: Tinou.